Our Family Rooms are an excellent accommodation option. Clean, modern and comfortable, the Family Rooms are close to the main holiday park facilities. 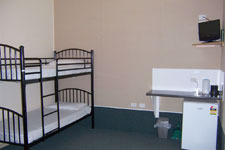 The rooms are a great way for couples, families or a group of friends to enjoy Whangateau. Available in a range of bedding configurations, sleeping up to six people. In-room facilities include jug, toaster, fridge, heater, TV, dining table, as well as full use of holiday park amenities. Excellent value for money. Bottom Sheet, Pillow and pillow case provided. Guests need to bring their own top bedding and all cooking / eating utensils.